"DEFT is a user-friendly XML authoring/editing tool which seamlessly integrates with Microsoft Word®; it takes as input any document which can be input into Word and produces an XML file based on any Document Type Definition (DTD) or Schema." It combines the power of Microsoft Word® with custom macros and dialogs to enable quick and efficient conversion of any document into XML (Extensible Markup Language). It was designed for users with little or no knowledge of XML, to be used in a multi-DTD high production-level environment. Although suitable for users with no knowledge of XML the basic concepts of the language become clear as the user becomes familiar with the system. With the aid of DEFT's macros, the user introduces a minimal amount of tagging into the Word document; tagging for the more complex sections, such as Bibliographies, is automated. No tagging is necessary for objects such as Tables, Lists, Equations, etc. Equations are created using Design Science's 'wysiwyg' equation editor MathType® and XML generated using MathType's built-in conversion utility. With this tagging, and by interpreting embedded Word formatting and structures, DEFT can generate a fully tagged XML file based on any DTD or Schema. The key to DEFT's ease of use is that all documents, can be tagged to the respective DTD requested by the publisher. 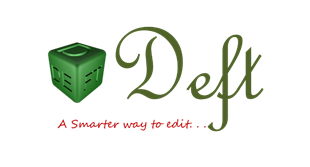 DEFT's built-in validator will identify any errors in the tagging structure of the Word document. As well as checking the structure of the document; DEFT's validator generates a list of cross-reference errors (cross-references pointing to non-existent target objects, multiple targets with the same ID and targets with no corresponding cross-references); the user must correct all errors reported by the validator before conversion to XML can proceed. Once the document has been tagged and validated, an intermediate XML file based on DEFT's internal generic DTD is produced; with this intermediate file as input, DEFT's DTD Engine takes care of the complex conversions required to produce a final XML file, which satisfies the specifications of the target DTD. The user end of the DTD Engine consists of various text files containing mapping information and procedures, written in the XLisp language, for transforming the XML input. All the transformation routines are contained in text files created by the user. A perl interface has been added to the latest versions to allow transformations to be applied via XSL style sheets rather than XLisp. As well as the DTD Engine, several aspects of DEFT's user-interface can be customised. When a document is first opened the user is presented with DEFT's Document Information dialogue. Amongst other fields, this dialog contains a drop-down list of publishers one of which must be selected. Once a publisher has been selected, DEFT loads a default set of (user-editable) text files which establish an interface appropriate to that publisher's DTD(s); this default set can be changed to suit other DTDs belonging to that publisher. One file establishes which options in each dialog are enabled/disabled; a second file can be used to provide translations for characters in any font; a third file is used to validate the document's tagging structure.